Studies show by the year 2019, 80% of the content consumed online will be video-based. This, my friends, is the reality none of us can escape. B2B, B2C, service, product, big or small-- it’s the reality we must face as businesses to stay ahead. 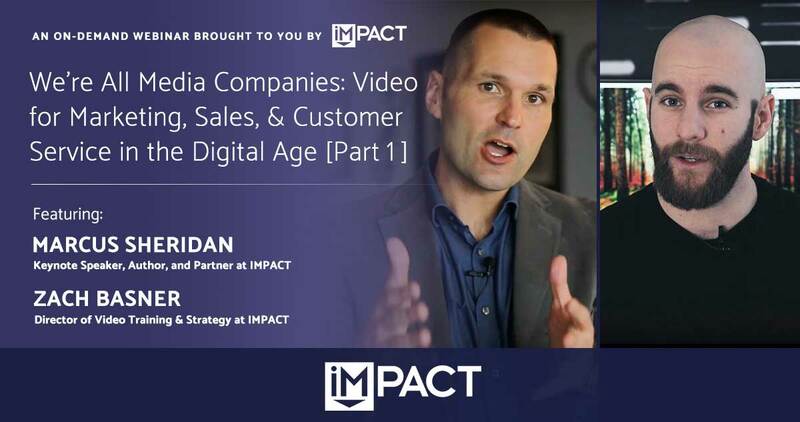 In conjunction with our friends at Vidyard, IMPACT Partner, Marcus Sheridan and Director of Video Training & Strategy, Zach Basner have designed this series to truly empower leadership, sales, and marketing teams to not only catch the vision of video moving forward, but address issues such as using video in the sales process, how to avoid common mistakes when getting started, and getting buy-in from your team and subject matter experts. Trust us, this is THE webinar series on video. And as a bonus, in this first webinar, you’ll get access to a free, self-guided video assessment test (to gauge where you are currently), a full list of all the equipment you will (and will not) need to get started, and much more. Remember, this isn’t just about your marketing department folks. This is SALES-centric, which means your leadership and sales teams will want to watch as well. In 2018 and beyond, if we don’t “show” it, it doesn’t exist. So, let’s start “showing” it. In 2017 Forbes named Marcus 1 of 20 “Speakers You Don’t Want to Miss the Opportunity to See." He has been featured in The New York Times, Inc., The Globe and Mail, Content Marketing Institute, Social Media Examiner and more. Having spoken to hundreds of audiences and thousands of people around the world, Marcus delivers riveting and passionate performances that motivate and inspire! As Director of Video Training and Strategy at IMPACT, Zach helps teams improve their sales and marketing efforts by creating influential and effective video strategies. He teaches them how to create high-quality video content in-house and empowers them by developing professional production and on-screen techniques. Zach has hired and trained more than 40 videographers, reviewed and edited hundreds of videos from across the globe, and shot and directed hundreds of his own. Also the host of Film School for Marketers on YouTube, Zach approaches video and film not only as his profession but a passionate hobby outside of the office. Every video tells a story, and Zach wants to help you tell yours.